Haven and her seven puppies, our most Recent Rescue, were found as strays in Tennessee. Haven was found with little-to-no fur and was just skin and bones. It was evident this dog and her litter of puppies were in desperate need of help. A good samaritan came upon Haven, so she began to feed her. After two weeks of visits from Haven, her rescuer followed her to an abandoned house where she found her seven newborn puppies under a deck. The puppies were so new that their eyes weren’t even open yet. Unfortunately, there were no rescues in the area that could help. That’s when Wright-Way Rescue offered to driver over 400 miles to rescue this sweet family. A team of rescuers dedicated their time to catching and loving on this sweet mom — we named her Haven to show her that she was now safe. Once arriving to Wright-Way Rescue after the long journey, Haven and her puppies finally received the care they needed. Haven was quickly diagnosed with sarcoptic mange, a highly contagious skin disease found in dogs, and was heartworm positive. We knew Haven had a very long journey ahead of her after she was finished caring for her family. Because of Wright-Way Rescue’s dedicated veterinary team, Haven was immediately treated for her skin condition and has slowly started to grow back her fur. After three months of skin and heartworm treatment, Haven has improved drastically. We can finally tell what color she is — brindle! Haven is also done raising her puppies, all seven were female and named after Disney princess, and have since been adopted! Haven is finishing her heartworm treatment today! 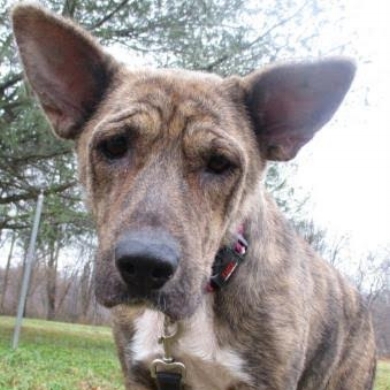 After a long road of recovery, Haven is now looking for her forever home. If you are interested in meeting Haven, please email Wright-Way Rescue at rescue@wright-wayrescue.org or call its Adoption Hotline at (847) 728-5434 Option 2. 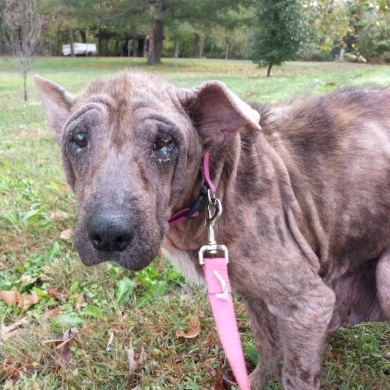 Donate to Haven's treatment to help other rescues just like her's.